We often refer to the rotational tendencies of the market – where leading sectors falter, giving way to new leaders. These changes in leadership occur in both healthy and unhealthy markets, and provide opportunities to reposition portfolios advantageously, both to enhance upside and to limit downside. As we move through economic cycles there will be varying degrees of change and that leads to themes. Sometimes the changes are secular, the result of disruptions affecting sectors unrelated to the business cycle. Understanding this dynamic is an important component to risk management, as every major correction has started with a “problem” sector. We present the chart below to show the rotational nature of the current market. 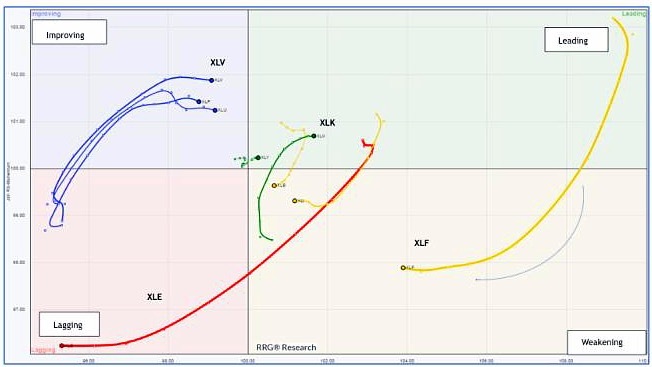 It illustrates the momentum and relative strength of the underlying S&P 500 sectors. It can be customized as to period, but for this purpose we chose to capture the first 12 weeks of the year. The clockwise movement is from upper right leaders to lower left laggards. One can see clearly that the two best performing sectors from 2016 are undergoing the sharpest corrections. Both Energy (XLE) and Financials (XLF) were up over 20% last year. It is not abnormal for a sector to pull back after an exceptional run. However, it’s our job to gauge the severity. You will notice that the correction in Energy has been much sharper, statistically moving from leading, to weakening and now lagging. The correction in Financials is much different and so far, orderly. On the positive side, that capital has moved into last year’s laggards with Healthcare (XLV) being the standout. Tech has been and continues to be leadership, however, we are mindful that wasn’t the case after the election. The lesson to be learned? Even in the context of a bull market, what’s “under the hood” matters. Should more sectors move into the lower left quadrant and change the current structure of the market, we would then look to take a more defensive posture.